The 25th Reich is the first crossover score from newly formed score companies "Movie Score Media/Kronos Records" and we couldn't be more pleased. Here is the update and information: GÖTEBORG, Sweden, August 20, 2013 | MovieScore Media/Kronos Records will release Ricky Edwards' fun, high-energy score to Stephen Amis's homage to classic B-movies, The 25th Reich, on CD. Based on the pulp novel 50,000 Years Until Tomorrow by sci-fi author J.J. Solomon, the film mixes the traditions of World War II adventures with elements of science-fiction – including the time travel of five American soldiers, who must battle Nazi robots and giant prehistoric animals while retrieving the ultimate super-weapon that can decide the war. 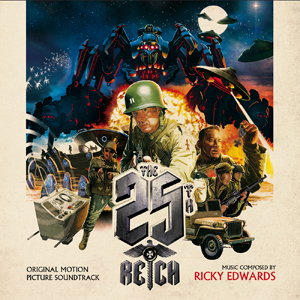 The score for The 25th Reich was written by Australian-born composer Ricky Edwards who has been working in the film music business since 1996. Edwards is the regular lead orchestrator for Oscar-nominated composer David Hirschfelder, contributing to titles such as Shine (1996), Australia (2008) and Legend of the Guardians (2010). Edwards' own scoring commissions include the hit Australian shows H2O: Just Add Water (2006-10) and The Elephant Princess (2008-11). The score to The 25th Reich is headlined by a superb march hinting at the dark forces at play, including a B-section that foreshadows the strong sci-fi elements to the story. Key action tracks include ‘That Ain’t No Puma!’ for the reveal of the giant fauna while ‘Attack of the 25th Reich’ offers an epic 8+ minutes long composition for the final battle. Like the film itself, the score is a delicious homage to classic war movies intertwined with nods to your favorite B-movie classics and timeless creature features! The 25th Reich is the first title to be released by the joint venture of MovieScore Media/Kronos Records, two European soundtrack specialty labels who announced their deal in late August 2013. “We are excited to work together on this first of many CD releases featuring exciting contemporary film music. Ricky Edwards' score for The 25th Reich is a very entertaining score which lovingly flirts with film music history in a way that makes it perfect for the premiere CD release under the unique collaboration between MovieScore Media and Kronos Records", said MSM founder Mikael Carlsson. Great things are happening and we are thrilled that these two are letting us be part of it. We had a short review last week [HERE] and this is one top notch war meets aliens score!